Thirty years ago, the future lay in programming computers. Today, it’s programming cells. 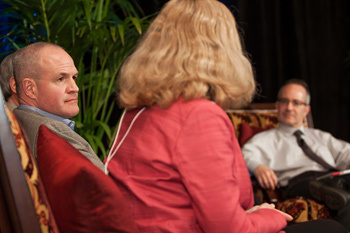 Jay Keasling (left), director of SynBERC, and moderator Corey Powell of Discover listen as Monsanto scientist Virginia Ursin explains the company’s interest in synthetic biology. Christine Fu photo. But other advances are on the horizon, he said, such as engineering new materials and engineering “green” replacements for all the products now made from petroleum. “Some of these have the potential to significantly reduce our carbon footprint, by say, 80 percent,” he said. 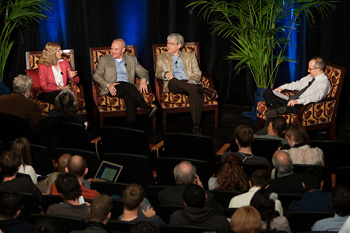 Ursin, Keasling and Steve Evans of Dow AgroSciences discuss the economic potential of synthetic biology with Discover magazine’s Corey Powell. Christine Fu photo.